Discovering the Estonian artist Kris Lemsalu initially at her durational performance at Frieze New York in 2015 and then again at CONDO (a collaborative exhibition by 36 galleries across 15 London spaces in January 2017), Marcelle Joseph is super excited to speak to Lemsalu to learn more about her multidisciplinary practice that melds ceramic sculptural installation with performance. Her work can be seen across Europe in a travelling group exhibition titled Metamorphosis and curated by Zdenek Felix that starts at KAI 10 | Arthena Foundation, Düsseldorf (4 March – 20 May 2017) and Galerie Guido W. Baudach, Berlin (10 March – 22 April 2017) and then travels to SVIT, Prague (May – June 2017). For those in the UK, you will have to wait until the autumn when Glasgow gallery Koppe Astner hosts her first solo exhibition there. Having studied ceramics at the Art Academy in Estonia, Lemsalu often mixes traditional materials (such as porcelain) with found natural materials (such as fur, leather and wool) to create humourous, ironic multilayered installations that flirt with notions of life and death. These uncanny installations often act as a stage for Lemsalu’s own performances with parts of the sculpture becoming a costume of sorts. A juxtaposition of high and low brow materials combined with a rough finish attribute a cynical element to her work that mocks art’s desirability in today’s overly moneyed global art market. I initially spotted you at Frieze New York lying face-down on a waterbed under an enormous ceramic turtle shell sculpture for a four-hour long performance entitled Whole Alone 2 (2015). Do you often inhabit your own sculptural installations? Is their performativity important to the work? And on the flip side, is the presence of your body and its interaction with the viewer adding another element to the installation? With some of my works, yes - they require my presence and contribution, a kind of baptism to continue their independent life and stay up late. 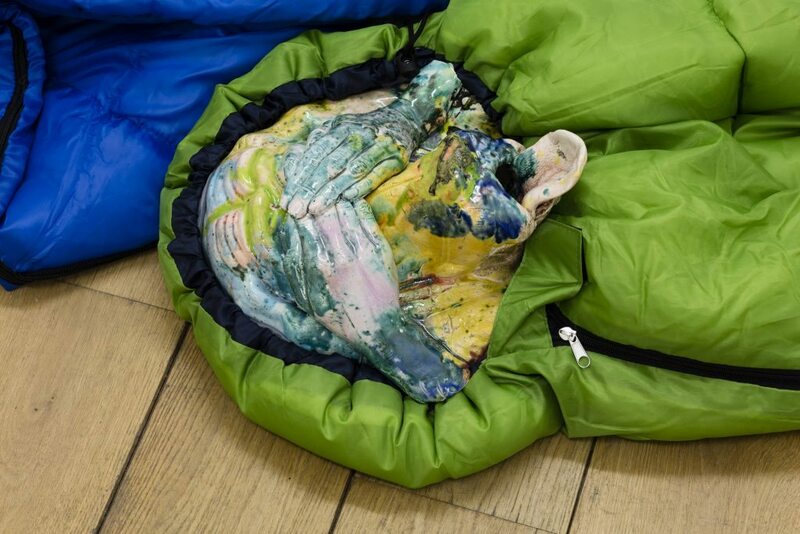 For CONDO in London at Southard Reid (January – February 2017), Koppe Astner presented a series of your Phantom Camp works, consisting of a porcelain dog’s head peeking out of a cheap polyester sleeping bag. These sleeping bags were dotted around the floor as well as hung at different heights on the wall with the sleeping bag trailing on the floor. The dog had his tongue hanging out and human hands covering his eyes. What captivated me the most about this installation was the combination of materials – refined porcelain with multi-coloured lustrous glazes and bargain basement sleeping bags. Can you talk about your approach to materials and their hierarchy? There is a playful and very visual process going on in my head while thinking about a new work. Basically I need the materials to float on the same level and the value given to various materials does not exist in my head so I try to give the same consideration to each of them. I work very fast and have developed easy ways for casting and dealing with ceramics. I have come to terms with the fact that heat has its own plans -- what comes out of the kiln may it be broken or exploded. Mostly I don't want any of the materials to sit in the back of the bus. The porcelain dog’s head with human hands and feet appears often in your sculptural installations going back to your work Father is in Town (2012). Who is this anthropomorphic dog and what does he or she represent? It shifts in meaning; it can be your best friend, an omen of death and all things in-between. When thinking about your work, the “cabinet of curiosities” and the “uncanny” often come to mind. What inspires your art production? My life and works are very much intertwined, so as long as I'm alive, I don't particularly need to search for inspiration. As a multidisciplinary artist, what comes first for you? The performance or the sculptural installation? The idea or the materials? First of all, it's the desperate need to communicate that makes me do what I do, so it depends what needs to be said. Lately my work feels more like a lone man's smoke signal at sea, trying to find other humans. Many young contemporary artists are breathing new life into the medium of clay. What inspires you most about the use of ceramics in your sculptural practice? I've worked with clay since I was 12 when my mother took me to a ceramics workshop with all the other neighbourhood kids. I took a break when adolescence kicked in, but after high school, I missed the material and decided to study ceramics at the Art Academy of Estonia. After that, I made some more attempts to abandon the material, but never managed to for too long. Clay is my healthy addiction and a physical need that lures me back to the studio - my Paul Simon. What shall we look forward to seeing in the travelling group exhibition, Metamorphosis in Dûsseldorf, Berlin and Prague this spring and summer? Do you identify with the show’s theme based around Ovid’s tales of transformations among gods, heroes, humans, plants and animals in your own practice? I look forward to seeing the other artists - Habima Fuchs, Thomas Helbig, Renaud Jerez and Mary-Audrey Ramirez again and for the rest … we shall see. Courtesy of the artist, Koppe Astner, Glasgow and Temnikova & Kasela, Tallinn. 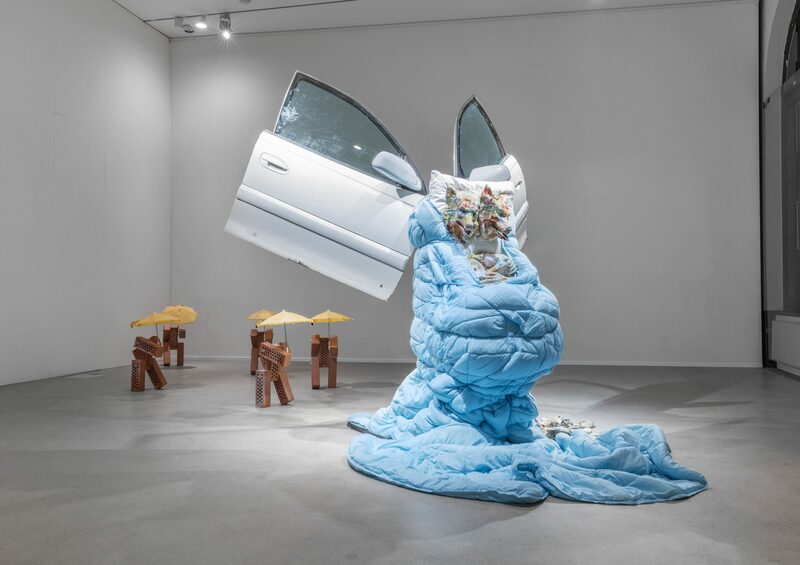 Kris Lemsalu, Car2Go, 2016, metal glass, plastic, brick ceramic and fabric, dimensions variable, installation view at Galerie Guido W. Baudach, Berlin, 2017. 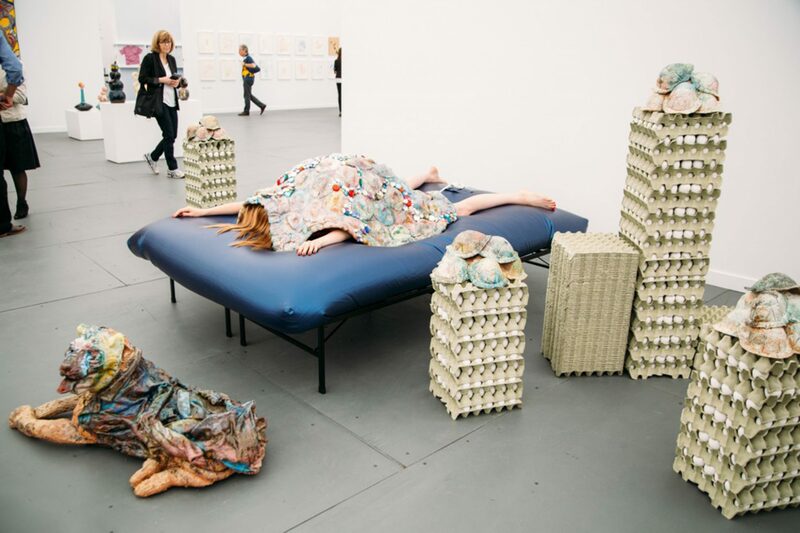 Kris Lemsalu, Whole Alone 2, 2015, porcelain, eggs and egg crates, waterbed, metal, hair, dimensions variable, installation view at Frieze New York, 2015. 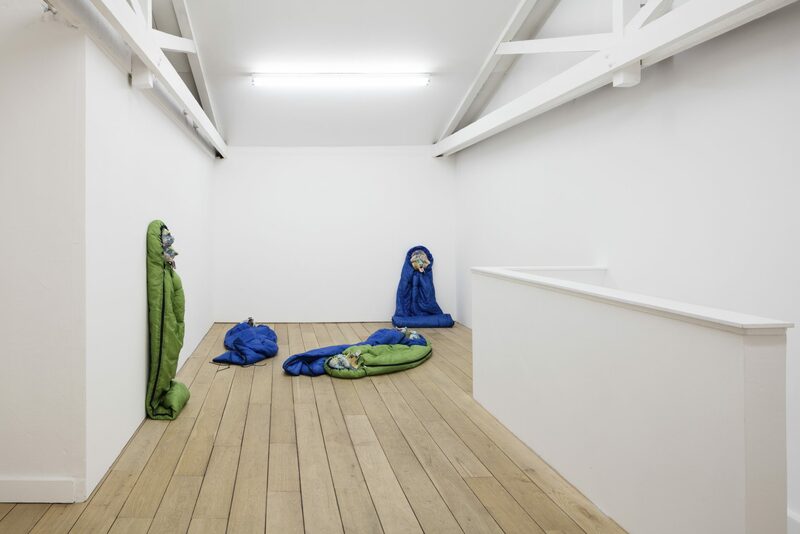 Kris Lemsalu, Phantom Camp, 2016, porcelain and fabric, dimensions variable, installation view at CONDO 2017, Koppe Astner at Southard Reid, London, 2017. 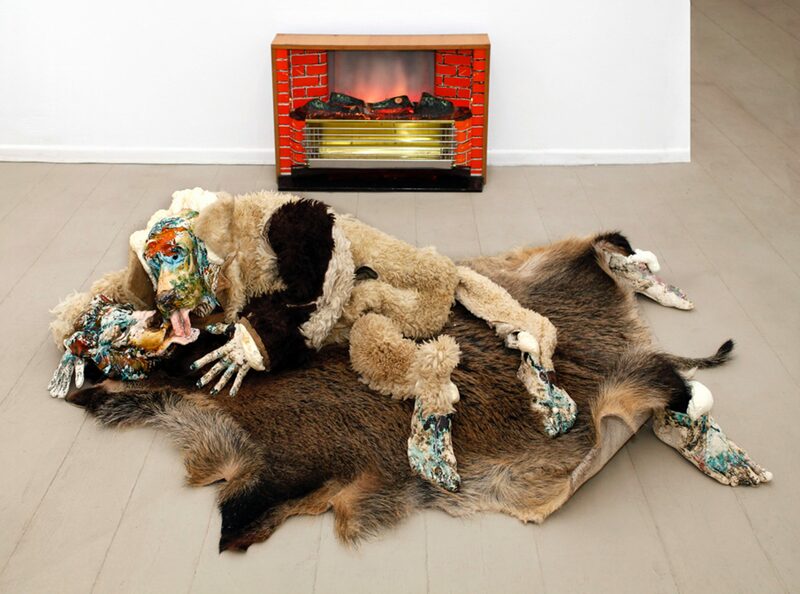 Kris Lemsalu, Father is in Town, 2012 ceramic, lamb fur, wild pig fur, foam, dimensions variable, installation view at Galerie Tanja Wagner, Berlin, 2012. Kris Lemsalu, Samsonite, 2012, autoportrait. Kris Lemsalu, Phantom Camp (detail), 2016, porcelain and fabric, dimensions variable, installation view at CONDO 2017, Koppe Astner at Southard Reid, London, 2017. Kris Lemsalu (b. 1985) is an Estonian artist based in Tallinn, Vienna and Berlin. She studied ceramics at the Estonian Academy of Arts in Tallinn and sculpture at the Academy of Fine Arts in Vienna. Lemsalu has shown widely both in Estonia and abroad. Her recent and upcoming solo and duo exhibitions include: upcoming solo show, Koppe Astner, Glasgow (2017); upcoming duo exhibition together with Merike Estna, curated by Thomas Cuckle, Tallinn, Vienna and Berlin (2017); CONDO collaborative exhibition, Kendall Koppe at Southard Reid, London (2017); "Afternoon Tear Drinker", curated by Hemma Schmutz, Kunstraum Lakeside, Klagenfurt (2016); "Beauty and the Beast", (together with Tiit Pääsuke), curated by Tamara Luuk, Tallinn Art Hall, Tallinn (2016); “Blood Knot Step By Step”, Bunshitu Gallery, Tokyo (2015); “Fine With Afterlife”, Ferdinand Bauman Gallery, Prague (2015); “Lord Got To Keep On Groovin”, Temnikova & Kasela gallery, Tallinn (2013); “Top Sinner”, Pro Choice, Vienna (2012); “Evian Desert”, Tanja Wagner gallery, Berlin (2012); and “Being Together” (together with Edith Karlson), Temnikova & Kasela gallery, Tallinn (2012). Selection of Kris Lemsalu's recent and upcoming group exhibitions and performances: "Metamorphosis", curated by Zdenek Felix, KAI 10 / Arthena Foundation, Düsseldorf; Galerie Guido W. Baudach, Berlin; and Galerie SVIT, Prague (2017); "Les Urbaines - 20th edition", curated by Elise Lammer, Les Urbaines, Lausanne (2016); "Winter Is Coming (Homage to the Future)", curated by Maria Arusoo, Georg Kargl gallery, Vienna (2016); Performance together with Gelatin, Manifesta 11, Cabaret Voltaire, Zurich (2016); "On Disappearing & For Vanishing", curated by Sten Ojavee, Tartu Art Museum, Tartu (2016); "Jumanji", Soft Focus Institute, Ghent (2016); "The Ultimate Vessel", gallery Koppe Astner, Glasgow (2015); "Sequences", real time art festival, Reykjavik (2015); “I’m A Painting” curated by Merike Estna and Kati Ilves, KUMU art museum, Tallinn (2014); “Urschleim”, Fauna, Copenhagen (2013); “is my territory.” curated by Monica Bonvicini, Christine König Galerie, Vienna (2013); and “Jeden Tag Gelatin”, 21er Haus, Vienna (2013).